Great knot for tying a rope tackle! A butterfly knot is a fixed loop tied in the middle of a rope. There are a number of other knots that do the same thing, but the butterfly knot tends to work better because it doesn’t jam when strained and it’s easy to untie. Since it’s tied in a symmetrical fashion, strain can be put on it from any direction. 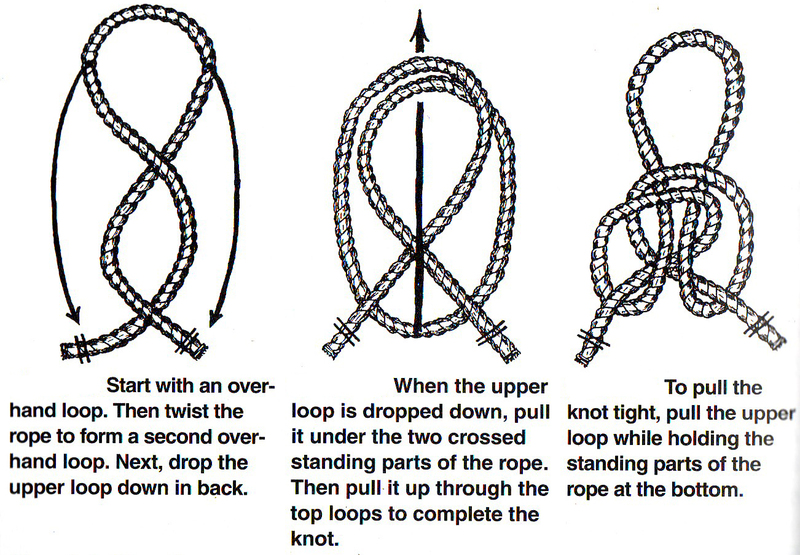 Even though this knot is usually tied in the middle of the rope, you can also tie it at the end of the line if you need a fixed loop that is easily untied. The butterfly knot is a favored knot for mountain/rock climbers, used for hand or foot loops or used to hook their carabiners into. It has many uses in pioneering work. When using a rope to pull a heavy object (such as a log), tie a series of butterfly knots to form loops for each person’s hand or shoulder. When climbing a rope, you can tie a series of butterfly knots to form loops for your hands and feet. To provide a fixed loop to use with a toggle. To tie up horses or anchor canoes on shore, tie a series of in a picket line for each horse or canoe. YOU’LL USE IT AGAIN AND AGAIN! The butterfly knot, also named the Alpine Butterfly and the Lineman’s Loop, has been referred to as the “Queen of Knots” by Pioneering legend, John Sweet.